Join us as we travel through time and explore US history with a musical twist! Learn about the origins and controversies of America’s national anthem, discover the evolution of spiritual music into blues, jazz, rock n’ roll, hip-hop and R&B, and live out your dream of becoming a hip-hop DJ by learning a funky beat, all with your local guide by your side! The United States is a country of rich culture and history, and there are few better ways to learn about it than the Smithsonian Museum of American History. But as amazing as this museum is, we know that everything is more fun when you add a little rhythm, so that’s what this tour is all about! Our guides will walk you through the museum’s exhibits and the many musical artifacts it holds, discussing music’s relevance to the incredible historical events and phenomena that inspired some of the best-known melodies in America today. 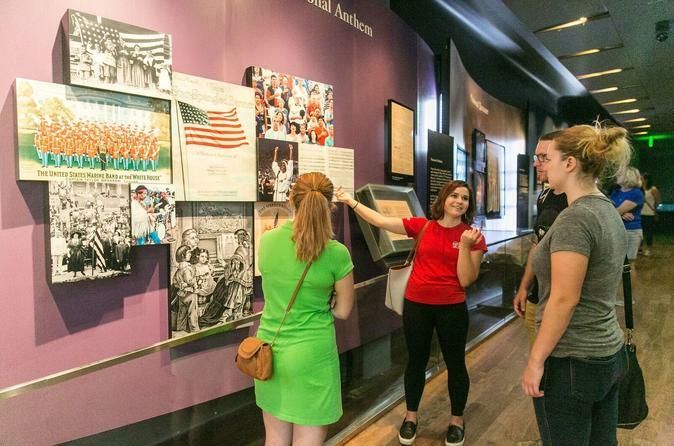 Your DC tour begins at one of the museum’s highlights, the Star-Spangled Banner exhibit. Here, you’ll discover the origins of the national anthem, the war that started it all, and you’ll even hear a few different versions of the song. You’ll also have the chance to see the original flag — Old Glory in all her glory. Next, you and your guide will boogie over to the African-American history and culture gallery exhibit and the museum’s ‘Many Voices, One Nation’ exhibit where you’ll see the vibrant, bedazzled, and downright wild outfits worn by dance legends and Broadway stars as well as the musical instruments that produced some of the world’s most famous jazz, soul, salsa and R&B tunes. You’ll explore the importance of music and the hidden (and sometimes not so well hidden) messages in songs that were used in political movements and times of struggle, and you may discover that you’ve been accidentally transmitting a code every time you whistle your favorite tune! Finally, you’ll end your tour between the '90s and the present-day, where you’ll discover how past rhythms and beats made their way into nightclubs and bars with the invention of electronic music equipment. As a bonus, we’ll give you a chance to make a beat of your own — who knows, you could be America’s next top DJ!